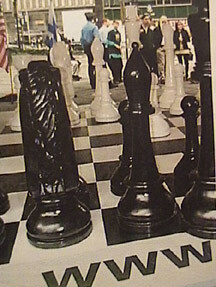 These chess pieces were built by O+S for Microsoft when Garry Kasparov “Played the World”. 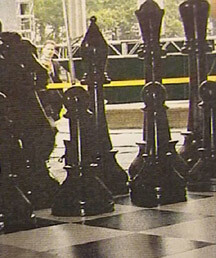 The set was used in various cities and he moved the pieces in response to on line players' moves. 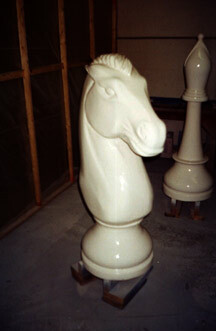 Beyond Design cast 5 pound density urethane foam in cylinder shapes. 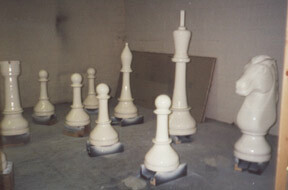 O+S turned and carved the shapes into chess pieces and then we applied RIMspray hardcoat on the foam parts. These were then sanded, primed and finish paint applied in a combined effort with Beyond Design and O+S employees.